As well as the full range of specialist Town Plannning advice and services provided by C60 Planning Belfast, we use our expertise to ensure that all of our projects pass through the planning system as rapidly as possible. Where others have a passive approach to planning, simply submitting the plans and waiting for a response, C60’s chartered Planning Consultants monitor and track all our projects . By doing this we identify any potential issue raised by consultees that could delay planning approval and deal with it as rapidly as possible. For our clients this represents significant time savings in gaining approval, which can often mean significant cost savings by reducing project duration and associated borrowing costs as well as bringing commercial projects to completion faster so that they can realise profit. We provide swift site assessments in plain English outlining the potential of a site and identifying any constraints that should be considered. Detailed planning policy statements including full review of the appropriate area development plan. We work with the whole design team in support of feasibility studies, business case preparation and economic appraisals. We can assess renewable energy site potential and liaise with the Planning Authorities to identify any constraints. We work within multidisciplinary teams and can advise on specialists where required. We work with your legal team in the preparation of evidence, statements of case and supporting reports for submittal. Our chartered Town Planners and Architects can provide professional Expert Witness representation at hearings. To crystallize a legal position we can use our expertise to obtain a Certificate of Lawful Development, often greatly reducing the need for legal argument and the associated time and expense relating to legal cases. We provide pre-application scoping of the potential need for Environmental Impact Assessment (EIA) submissions as part of a proposed development planning application. Where required we advise on the the appointment of specialist consultants. We coordinate their input and compile the EIA. We facilitate Pre-Application Discussions to ensure EIAs fully meet legislative requirements. By providing early warning of potential issues, we help address problems before they arise. Co-ordination of site surveys, wildlife surveys, archaeological surveys and any other specialist reports required. We prepare Environmental Impact Statements and Non-Technical summaries in plain English. 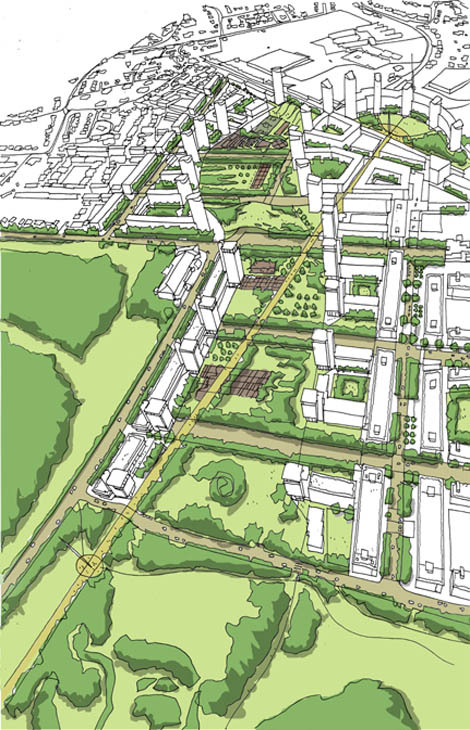 C60 Town Planning Belfast can produce complete master planning design solutions in-house. We provide programming advice to sequence development and ensure compliance with legislative requirements. Our creative team can help review multiple development options and seek out the solution which best meets your needs. Complete community and stakeholder consultation management. We can provide representation during political negotiations. Our skilled designers can prepare questionnaires and leaflets for community engagement and we can facilitate community engagement events during applications.